Quick and easy dinners don’t have to be boring! 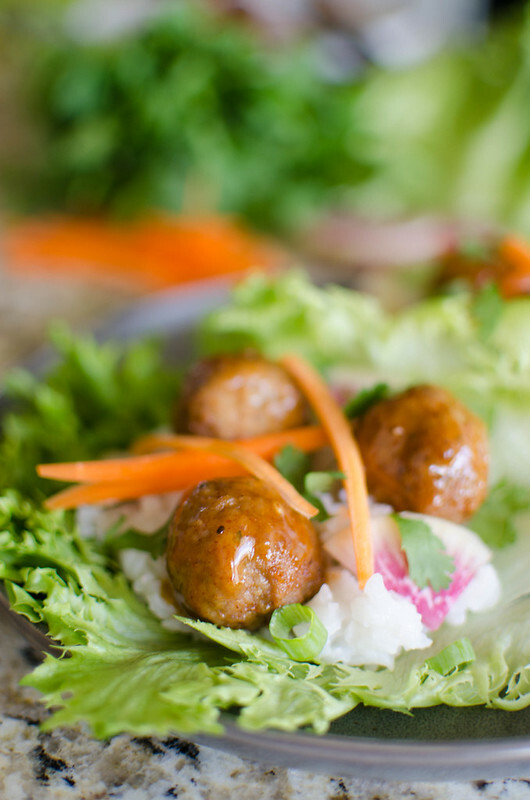 Korean BBQ Meatball Lettuce Wraps are ready in about 20 minutes and the whole family will love them! Hi guys. I’m going to share my current obsession with you today. You know how much I love all things Korean bbq, right? Like, if I absolutely had to pick my favorite food – we’re talking last meal here – it would be Korean bbq. I’ve even got my kids hooked on it which on one hand is good but on the other? I don’t wanna share my bulgogi fries with anyone! Not even my own children. So I’ve found these meatballs by Cooked Perfect® and I’m going to recommend you all go out and buy them. 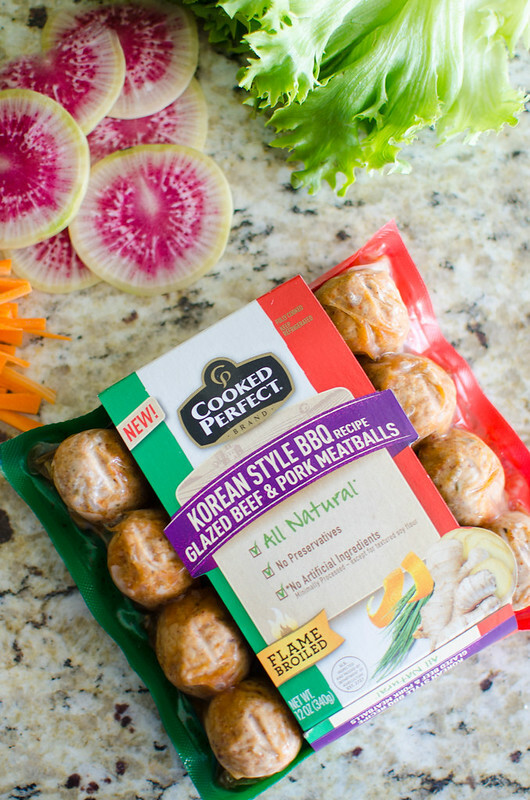 They’re the Cooked Perfect Fresh Meatballs in the Korean BBQ Beef & Pork flavor. They’re fully cooked and my favorite part is that they come in a self-venting package that you can pop in the microwave for 2 minutes and they are ready to go. It makes them perfect for quick and easy weeknight meals, especially if you’re like us and constantly have afterschool activities. Pop them on a baguette for a meatball sandwich, make a stirfry with lots of veggies, or make lettuce wraps like I do with them. Each package comes with 2 easy recipes so you really don’t even have to come up with your own ideas. Besides the Korean BBQ Beef & Pork flavor, Cooked Perfect Fresh Meatballs also come in Italian Style Beef and Pork, Sundried Tomato and Roasted Garlic Chicken, Taco Seasoned Glazed Beef and Pork, Spinach and Feta with Parmesan and Mozzarella Chicken, and Italian Style with Parmesan and Mozzarella Chicken. 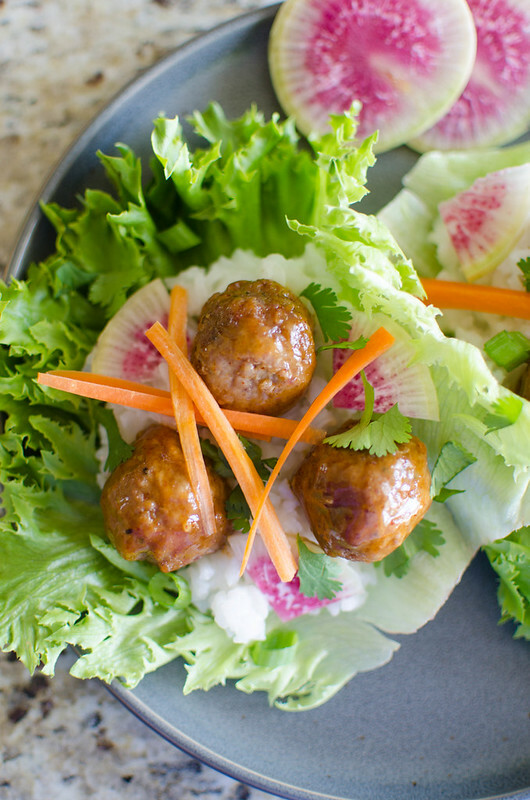 So for these lettuce wraps, you’re going to need my favorite Korean BBQ Beef & Pork Meatballs and you’re going to cook those in the microwave for 2 minutes. They’re going to moist and delicious and have extra sauce for you to drizzle over the lettuce wraps. Mmhmm. Then you’re just going to take some lettuce leaves – whatever kind of you like. I like bibb or this kind that my grocery store labels are “burger lettuce” but you can use whatever variety you want, as long as the leaves are big enough to make a wrap. Take the lettuce, put a generous spoonful of rice in the center and top with a couple meatballs. Drizzle that sauce over the rice and the meatballs and then pop some fresh veggies on top. I like carrots and radish because they both give a really good crunch. Then top everything with green onions and fresh cilantro. Then you just fold it up and enjoy! Seriously, so easy. Especially if you’ve already got rice in the fridge or use an instant rice! 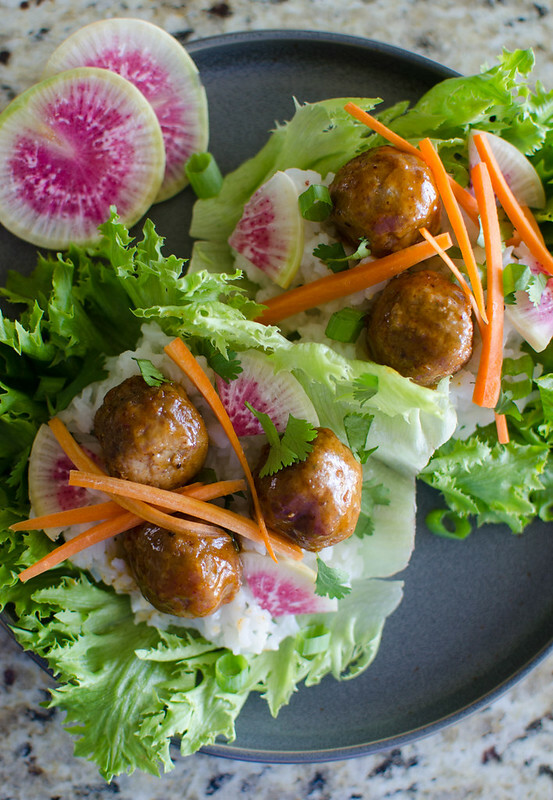 If you think your kids won’t eat lettuce wraps, put meatballs in them. I can almost guarantee that they will love them. Cook meatballs by placing the self-venting package in the microwave on high to 2 - 2 1/2 minutes. Let sit for 2 minutes and transfer to a bowl, making sure to get any sauce in the package. 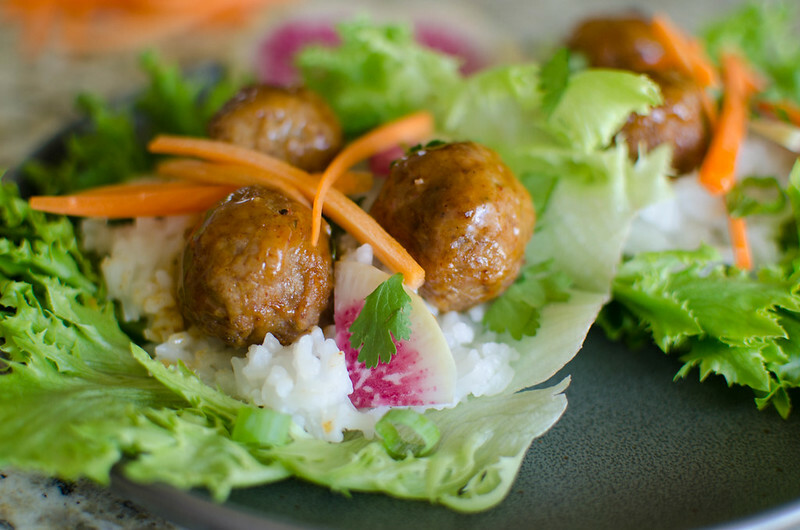 To assemble the lettuce wraps, divide cooked white rice between the lettuce wraps. Place meatballs on top of rice and spoon leftover sauce over rice and meatballs. Top with carrot, radish, green onions, and cilantro. Serve immediately. 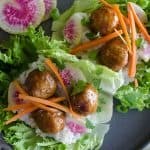 8 Responses to "Korean BBQ Meatball Lettuce Wraps"
These lettuce wraps look amazing! I wish I had some for dinner tonight! Lettuce wraps are my kind of meal for the summer months. Some lack flavor, but these are BURSTING! Bravo! Love this idea! Sounds perfect! Such a fantastic idea!! I LOVE these!! I love this brand but haven’t seen this flavor yet. I’ll have to keep a lookout because these wraps look so good! Love a light and healthy lunch idea! This is perfect! Amazing! This is a fine dish that I would love to make again and again.